Everyday happiness you are looking for? Once NHK TV morning drama took place with linking Asakusa and Niigata. Eel restaurant in Asakusa cannot be referred without one of the best Sake in Japan. Hakkaisan, literally meaning of Eight Ocean Mountain, can be seen the best picturesque view from Muikamachi (literally Six Day Town, Mui Ka Machi). Their brewery is in top secret zone, but thanking to modern technology, you can actually catch the satelite view at Google Map. Do not drink and drive the wrong side of the road! And your itinerary can be scheduled at this site. Just a few example below (without JR Pass). Let's talk back to Sake story. Are you on your way to Kanazawa? Tokyo => Echigo-Yuzawa (Muikamachi) => Kanazawa? Then, Kagatobi (Kaga-Tobi) is as good as Hakkaisan. You may find their English site at this page , please. 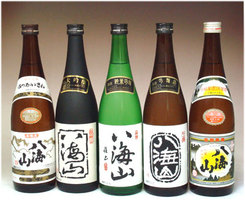 In Asakusa, there is a Sake bar called SakenoDaimasu for Sake tasting, more than 100 kinds of Sake from all over Japan. Hokkaido has famous Nikka (Yoichi) Whisky (their peat in Hokkaido is as same as the one in Scotland!) and Sapporo Brewery Kengaku and Sapporo Bier Garten (Beer Garden, may cost a bit). Within Tokyo, very convenient to visit, there is Musashino Beer Factory, just west of Shinjuku. Not far from Tokyo has Suntory Hakushu Factory in Yamanashi-ken. There is even a free shuttle bus serivce from/to nearby JR station. Yamanashi-ken is also famous for Japanese Wine. Really? You may taste your fruity life at Tomi-No-Oka. And the BEST whisky in Japan (some even says that BEST of the world, even better than Scotch?!) can be completed with Kyoto city tour. Suntory Yamazaki Factory is the one! And here's the "BEST" of angel's sharing !(^^)! Bored with Hakushu and Yamazaki? You must be very serious! In Chichibu, Saitama-ken, there is a small company called Chichibu Distillery , which produces Ichiro's Malt with very limited volume. Already planning to visit the distillery? Here's the way from downtown Tokyo (from Tokyo Ryokan). And here's got more!